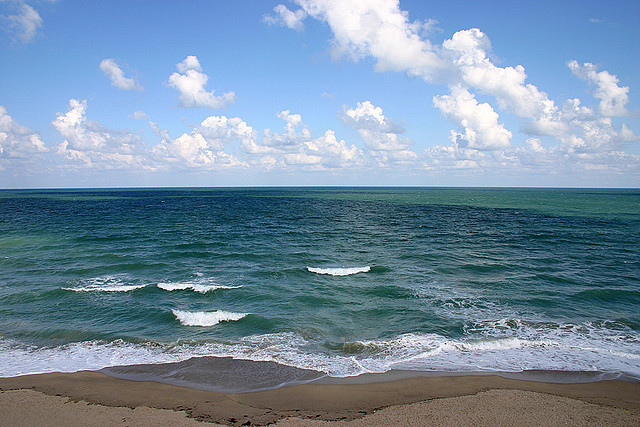 Florida coast; photo by John Biesnecker on Flickr (noncommercial use permitted with attribution / share alike). Florida is the fourth most-populated state in the country, and it's beaches draw thousands of tourists every year. Most of the state has a humid subtropical climate, except for the southern part below Lake Okeechobee (which has a true tropical climate). The Florida Keys (surrounded by water) have a more tropical climate, with less variability in temperatures compared to mainland Florida. In Key West, temperatures rarely exceed 90 °F (32 °C) in the summer or fall below 60 °F (16 °C) in the winter (frost has never been reported in the Florida Keys). 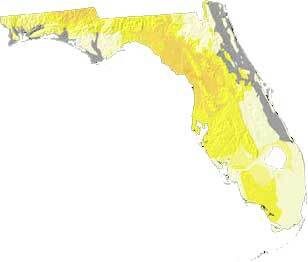 Florida geology and topography map from USGS: A Tapestry of Time & Terrain.